It’s April, and right on cue, annual bluegrass is flowering in turfgrasses around the state. 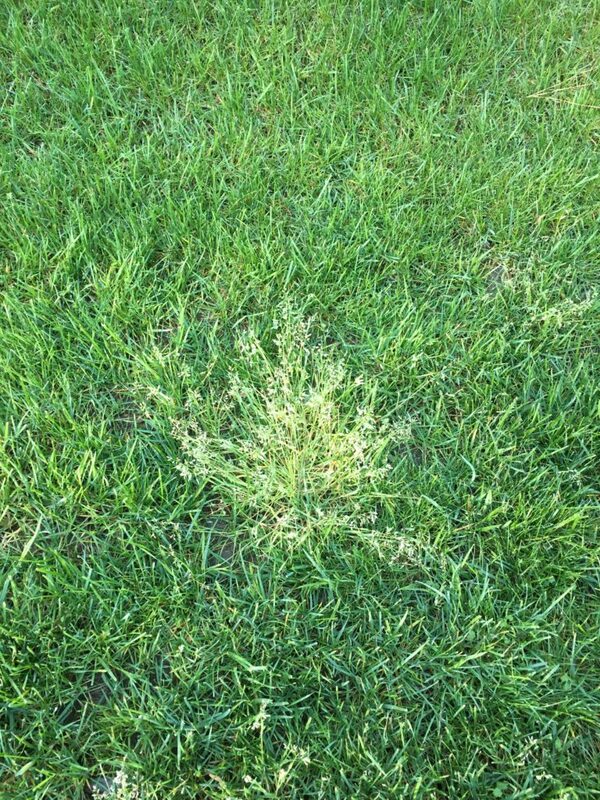 Concerns/complaints about annual bluegrass in lawns have been abundant this spring. Perhaps this weed infestation is worse this spring and there is likely a reason. It was due to weather conditions last fall. Now for the explanation. First, a little about annual bluegrass biology. Annual bluegrass is a winter annual weed. That means it germinates in fall (even though you do not see it), and flowers in spring and dies as temperatures rise in late spring and early summer. In North Carolina, about 80% of annual bluegrass germinates in a 60-day window from September 1 to October 30. A good indicator of annual bluegrass germination is when the night temperatures start to cool a little in early September. The remainder germinates later in fall and in early spring. When germination occurs in September/October, the weed is often unnoticed due to the fact that it is a small seedling and most importantly, warm-season grasses are still green and actively growing and cool-season grasses are obviously still green. In short, annual bluegrass germinates and goes unnoticed. In the coldest part of winter with low light (short days with a low sun angle), annual bluegrass goes semi-dormant. 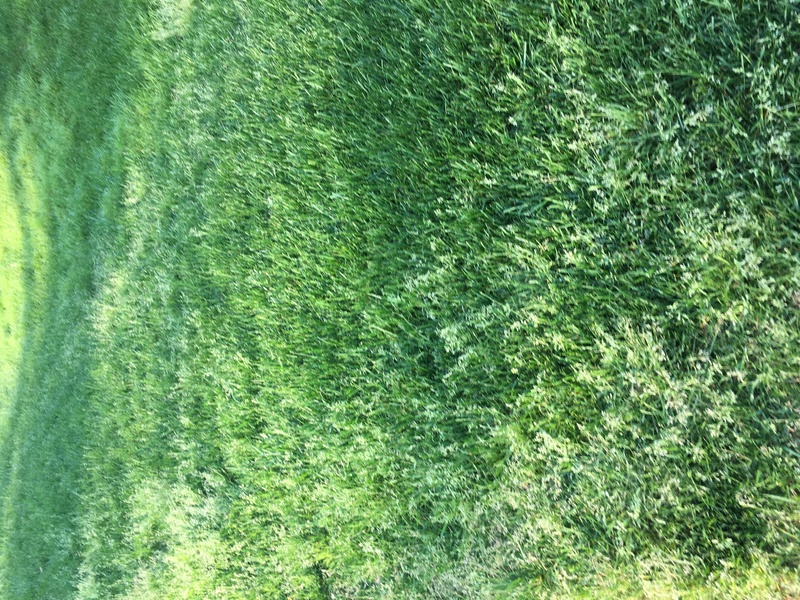 In spring, as days are getting progressively longer and sunlight quality gets better, annual bluegrass grows rapidly, flowers, produces seed, and dies in May/June as temperatures get warm. The life cycle is complete. 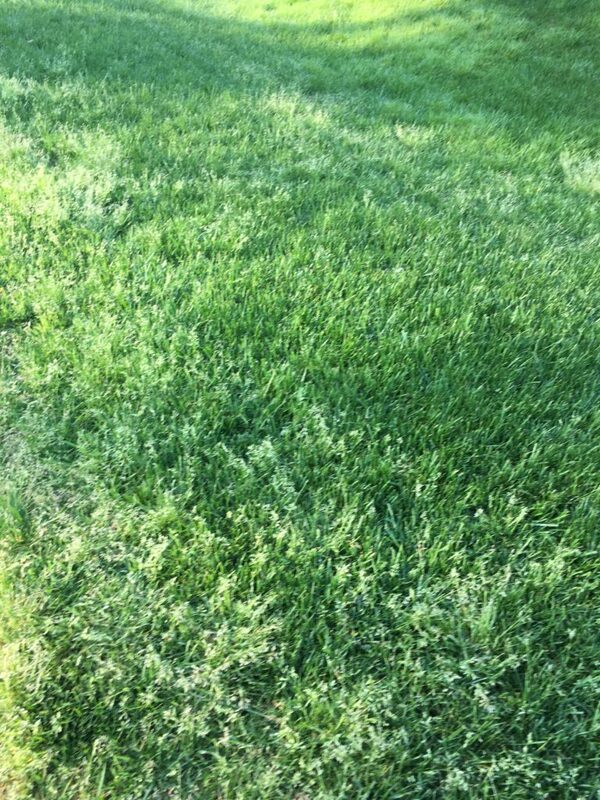 Why could annual bluegrass be worse this spring? The first thing to understand is annual bluegrass has a high light requirement for seed germination. Therefore, when sunlight penetrates through the turfgrass canopy, conditions for germination of annual bluegrass are enhanced. Another way of stating this is, the thinner the turfgrass canopy, the more annual bluegrass will germinate and the worse the problem will be the following spring. Now for the explanation: Conditions for fall seeding and early growth of cool-season grasses last fall were less than ideal. Most will remember Hurricane Florence that dumped about 6 inches of rain in the triangle but that is only part of the story. 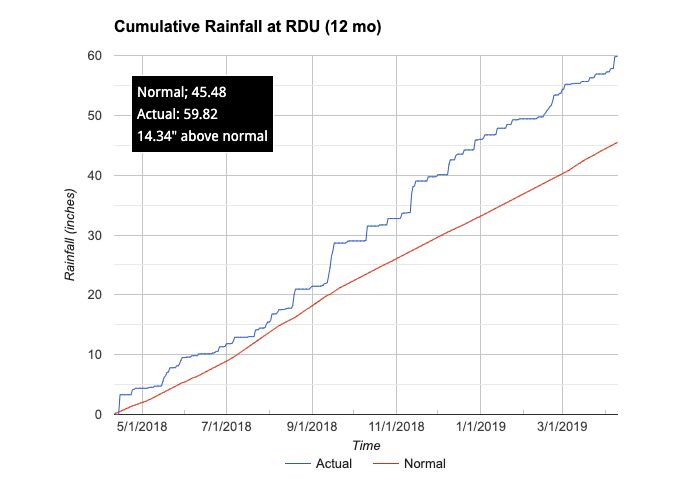 Rainfall at RDU during calendar year 2018 was about 14.5 inches above normal (see rainfall chart, courtesy of WRAL.com). This excessive rainfall in fall was detrimental to good tall fescue (and other cool-season grass) establishment. The turfgrass seed germinated, but a lot of it died due to excessive wet conditions. In other words, the fall of 2018 was a bad fall for successful cool-season grass establishment. Therefore, the turfgrass canopy was open, sunlight penetrated to the soil surface and annual bluegrass germinated. Now, in April, we are seeing the results of the wet fall: more annual bluegrass flowering that germinated last fall. The good news is, it will all die out in late May and early June. The bad news is, you will just have to look at it until then. There is no way to selectively control annual bluegrass in the spring in tall fescue and other cool-season grasses. However, there are many options for control in warm-season grasses. 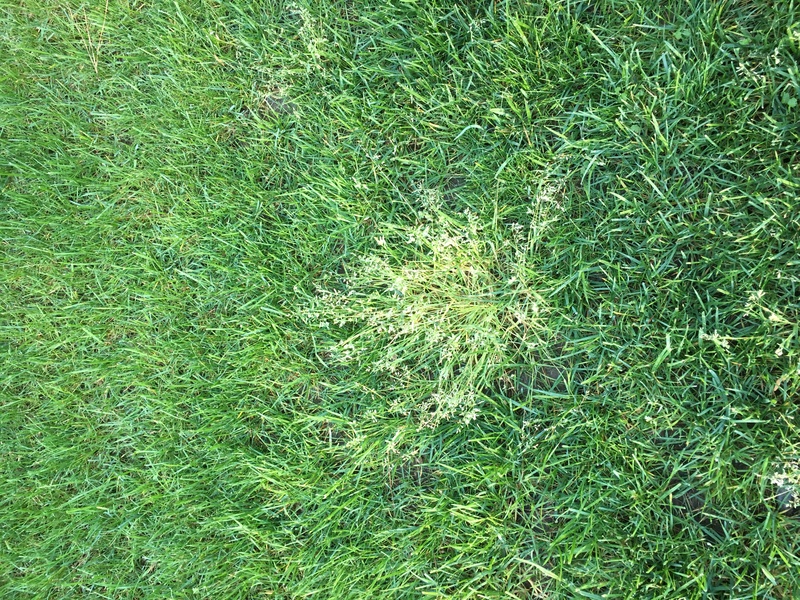 For control of annual bluegrass, preemergent herbicides that are typically used for crabgrass are effective and can be used in tall fescue but need to be applied and watered in by September 1. The downside is, these herbicides will prevent any reseeding of tall fescue and other cool-season grasses. From a practical standpoint, the most effective strategy is to utilize cultural practices (including seeding) in fall that maximize turf growth and minimizes sunlight penetrating through the canopy. Soil shading is the best defense against annual bluegrass. • Will My Vegetable Seedlings Survive This Weekend's Cold? • Grassology! as Seen on TV!